Note to readers: this post was originally published on the author’s Medium account. Check this link to read it from the original source. Central Asia is regarded as a region of excellence when it comes to the production of artifacts such as carpets, textiles and felt. This traditions have been deeply explored and rightfully celebrated, however very little can be found on the design of everyday things in the region. The Southern part of Kyrgyzstan, a rather small country of 5 million, is especially interesting because of its mixture of influences: the main town, Osh, is a 300.000 people settlement only a few kilometers from the border with Uzbekistan, and as such hosts a very diverse population of both Kyrgyz and Uzbek heritage. In the region surrounding Osh the traditions of the two countries, which have very different stories (the first based on nomadism, the second on the production and trade of textiles and cotton) are intertwined and often difficult to separate by the eye of an outsider. Here it is possible to find handmade objects which origins can be traced in other regions of Central Asia, but that might be unfamiliar even just in the Northern part of Kyrgyzstan, a few hundreds kilometers away. They are mainly devoted to the art of honouring guests, the making of most simple food (bread, especially), the care of the family and, lastly, the connection with the environment; they speak about craft, attention to detail and love for the home. The toshok (төшөк) is probably a good place to start from since it boasts an ancient tradition that can be traced across different cultures. It is a thick, double-sided quilt stuffed with embossed cotton, mainly designed to sit on it; it stays folded and neatly stored in piles somewhere in the house when not used, and is unfolded and placed around when needed. This object can be found in practically every household in Kyrgyzstan: it represents the very essence of hospitality. Its origin can be traced within the nomadic tradition, a fundamental part of which is a smart use of resources— as such, the toshok does not have one defined function but instead it reflects the needs of its user at any given time. The toshok is used to sleep, sit, rest, read, cover, or even to give birth on; it can be unfolded for ourselves, for a guest, or a group of friends; it can be placed in any point of the house, inside or outside, on the floor or on another support; it can be stacked on others to create a higher or softer sitting spot. Every toshok is different, handmade, and makes use of various textiles and colors, on two sides — which are clearly distinguished: one highly decorated, made of more expensive, shiny materials and intricate patterns; the other kept rather simple, usually in one color, put together with affordable supplies. Cheaper, more ordinary toshoks are used regularly within the family, while the most valuable and decorated ones are kept for special occasions. Putting the best and most expensive toshoks on top, where the guest will sit, is a way of showing respect and hospitality. Toshoks come in four different kinds: Zhuurkan is the name of the blanket version of it, Jer-Toshok is the mattress kind, Beshik Zhasalgalary is the one used as baby blanket, whilst the Zhazdyk is used as pillow. Every newly married couple receives a number of toshoks as a part of the dowry, being amongst the most basic and needed supplies in any home. In some households dozens of different toshoks can be found, all stored on top of one another, and most of them can stay unused — even for several years: they often become, in fact, a way of preserving the memory of loved or lost ones, usually parents that donated them in the first place. The second object is related to an essential component of Central Asia’s culinary tradition: bread. Slightly different in different areas, and sold every morning in the order of millions, the lepyoshka or japma nan (жапма нан) is a specific kind of round-shaped soft bread which accompanies every Kyrgyz meal and, more importantly, the ritual of drinking tea in various moments of the day. In Kyrgyzstan people regard their bread with a special kind of love, and so it happens that each lepyoshka comes decorated with patterns carved on its surface: the chekich (чекич) is the tool of choice for the job. A chekich is shaped as a rounded handle with a pattern made of nails attached to it, and it is used to stamp each bread by hand before it goes in the oven (tandyr / тандыр). It is one of the most charming handmade objects one can come across in Central Asia, impressively beautiful in its simplicity. Three are the things you will need to consider when looking at a chekich: pattern, size and material. Combining these, the possibilities are practically endless and, in fact, no chekich looks like another. Drawings are inspired by simple natural motives or traditional shapes; flowers of different levels of complexity are a recurring feature. The size of the tool can vary greatly, from the smallest — of 2–3 cm of diameter which are used to cover big surfaces, such as wedding breads, with several small carvings — to the biggest ones that can reach a diameter of 15–20 cm and get quite pricy. Lastly, materials can also be different and constitute an indicator of quality. The wood of choice for the handle, that ensures durability and weight, is walnut (Southern Kyrgyzstan hosts the biggest walnut forest on Earth), recognizable by its weight and its distinctive brown color. The less expensive alternative is the chekich made from apricot tree, which has a yellow shade to it. Other types of wood can be used, which have brighter shades but are not as durable. The nails of the stamp should be made of metal and firmly mounted into the wood. The not-stamped edges of the bread rise while it cooks in the oven and will be soft to the touch, while the center, pressed by the stamp, will stay crunchy and solid. Chekich are sold in local bazaars, sometimes accurately aligned with one another, other times thrown together in a messy bunch: choosing the right one can be quite a long process and requires some specific knowledge. The origin of this object remains elusive, but there is at least on chekich in every household in Kyrgyzstan and everybody knows what a chekich is, looks like and is used for. Its value is not questioned nor surpassed. On the contrary, it is considered an important part of Kyrgyz identity: as a friend put it, “it has been around for as long as I can remember”. It is easy to mistake a shimek (шимек) for something else: it resembles a musical instrument, or a smoking device (a friend from Israel gave one of these to his grandpa, convinced it was an extravagant smoking pipe, with hilarious results). None of these are true, and in fact almost nobody can guess its actual purpose— except, of course, if you are from Kyrgyzstan, where everyone perfectly knows that a shimek is nothing else but a very special kind of baby diaper. 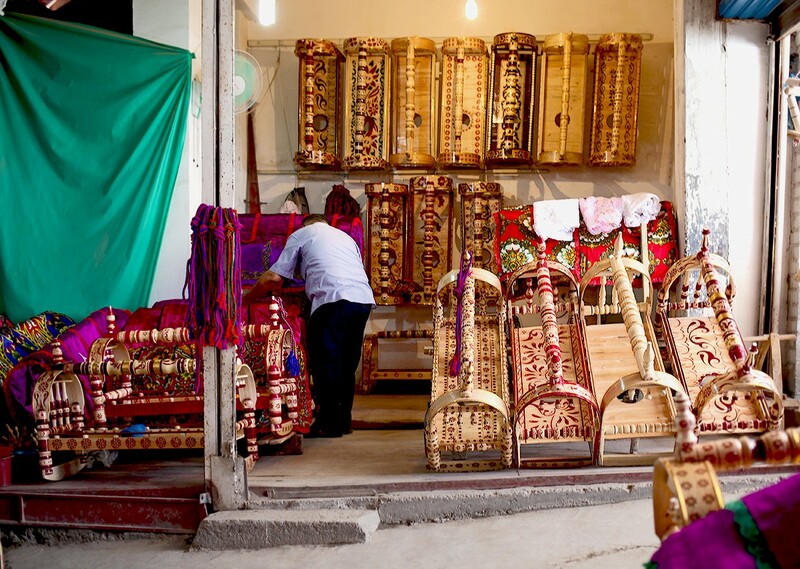 In the region, a decorated wooden cradle (the beshik) is used to move and care for newly born babies, and the shimek plays a crucial role in ensuring that the baby stays dry and clean. The cradle comes with a jar to receive the child’s pee: a hole located between the jar and the surface where the baby lays serves as a corridor. The shimek, inserted vertically between the legs of the infant, passes throw the hole, draining the urine to the jar. A beshik (baby cradle) on sale at Osh bazaar. The hole for the shimek in visible on the middle surface. The beshik is another example of a beautiful, highly decorated handmade object. The bedding for the baby is also handmade. The reason why a shimek is so counterintuitive to understand to a stranger’s eye is probably due to its peculiar shape, natural materials and beauty, something peraphs hardly associated with the simple function of keeping a baby dry. Kyrgyzstanians take particular pride in this handmade object for its sustainability and long lasting properties: contrary to disposable diapers, the shimek is not thrown away, is does not create waste or pollute the environment, it is made by hand from natural materials only, and can be used over the course of several years (and babies). Two version of the shimek exist: male and female, and they come in similar shapes except that the version for boys closely resembles a smoking pipe, hence my friend’s confusion. In both cases, the shimek is put between the legs of the baby, which are tighlty swaddled together to ensure it stays in place. This device is used mostly during the night; hygienic issues are addressed by washing it with running water after use and put it under the sun to dry. Materials of manufacture can include plastic or cheap kinds of wood, but the most prestigious and durable is, once again, walnut tree. It will be a loyal companion for the child until her or he will stop sleeping in the cradle – at least up to the next baby. Despite being very different from one another, these objects have one common feature: they speak loudly about the celebration of hospitality and sense of family that are such fundamental components of Kyrgyz mentality and approach to things. If you will visit Kyrgyzstan as a guest, you will never be disappointed. Benedetta Crippa is a graphic designer working with visual communication in a holistic way. She believes in the power of design for giving voice to whom needs to be heard the most, and she strives to work with projects she believes in and people she can learn from, paying special attention to perspectives around representation and cultural diversity. The clients she has been working with in recent years are mainly engaged with civil society, anti-racism, gender equality, and human rights. As for writing, her main area of interest lies at the intersection between visual culture and feminism, and she is working on developing her own voice. Between 2012 and 2016 she has spent almost two years working and doing research in Nepal and Kyrgyzstan. This post was originally published on the author’s Medium account. Check this link to read it from the original source.